Home > Building your freelance business > IR35: Are you independent or an employee? IR35 is UK legislation that defines a person’s employment status and can distinguish whether someone is an independent contractor or an employee. Knowledge of this legislation is very important for contractors, the self-employed and freelancers because it can determine how much tax they pay. Understanding how this works and where you fit is an important part of cash management and knowing your small business expenses. IR35 was introduced as a method of stopping employees claiming to be independent contractors. Prior to IR35 a number of people were performing the jobs of employees and receiving the benefits of being employees (a regular wage, pension contributions, no financial risk etc…) but claiming to be contractors and therefor paying corporation tax (22%) instead of PAYE (40%) and NI (variable). The problem for many freelancers is that, while they may not work traditional jobs, many contracts they enter will offer them sufficient benefits to class them as employees in the eyes of IR35. 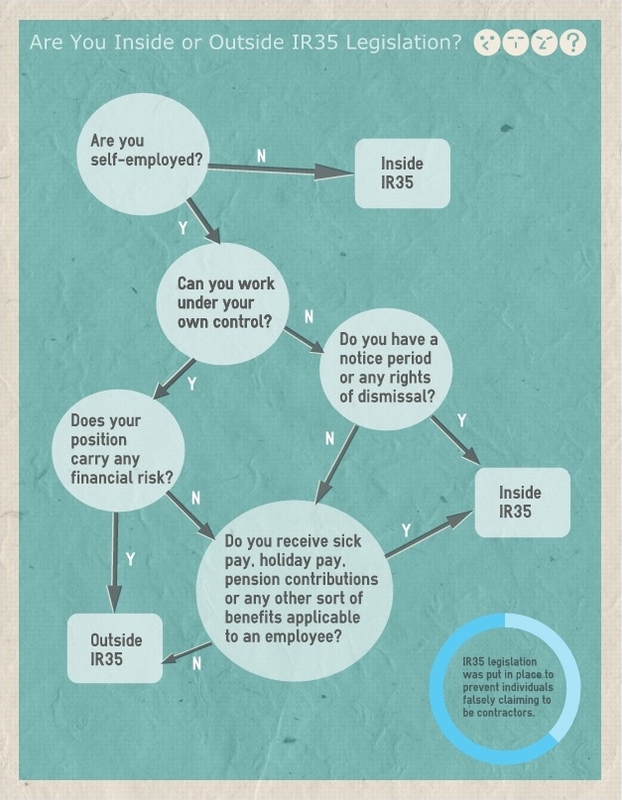 Being “inside” IR35 legislation means that you are technically an employee. HMRC will class you as inside IR35 if you receive a regular wage, do not have to pay for your own equipment or tools, receive benefits such as pension contributions or sick pay, have an identifiable boss and have no financial responsibility for your work. If this is the case you will have to pay PAYE and NI contributions. Being “outside” IR35 means you are truly independent and will operate in a similar manner to a limited company. To be “outside” IR35 you will, generally, be paid a predetermined amount for a job regardless of how long it takes to complete, use your own tools, be financially responsible for the quality and time frame of your work and have complete control of your work. HMRC can penalise anyone who is deemed to be incorrectly representing themselves with regards to IR35 and can issue penalties relating to the amount of tax that has been avoided. Around 2000 IR35 investigations were launched this year (2012) meaning they are relatively common. If you pay attention to the factors above it should be fairly easy to determine where you stand with IR35. That said, if you are still unsure, you can get advice regarding IR35 from employment lawyers or accountants that specialise in small businesses and independent contractors. Kevin Ball writes on behalf of The Accountancy Partnership who provide specialist accounting services for a variety of small businesses, sole traders, freelancers and contractors. Want to write for Creative Agency Freelancing?